The KM Elite Products are an excellent must have in any pet owner's first aid kit. This flexible bandage is easy tear and stick to itself for easy, hassle free application when dressing wounds. The bandage will not loosen or move once applied. Each bandage is individually wrapped for extra hygiene and measures 10cm in width. The total length of each bandage is 4.5 metres when stretched. 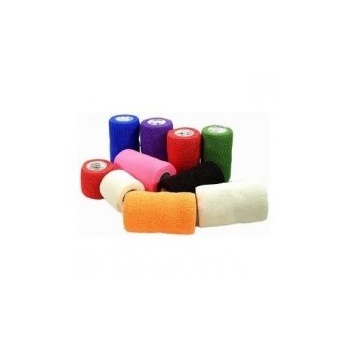 These bandages can be used with dogs, cats, horses or any animal, which has a wound that needs to be bandaged. KM Elite Vet Wrap is the most powerful, flexible bandage that sticks to itself. Available in Neon Green, Pink, Blue, Red, Black and Orange. Please specify if you would like a certain colour, as otherwise we will choose for you. Please kindly note - do not apply too tightly or over open wounds. Dress wounds properly first before bandaging; press firmly to secure. If in doubt, please call your vet.